Efile Training for experienced techs and beginners!-Educator Alina. This educational training program is two full days of intensive, hands on training with live models on day 2. Each student will learn about the efile machine and how to correctly use, its capabilities and purpose. All types of bits and burs will be covered, their purposes and uses. How to disinfect and clean properly. Different techniques for using Efile will also be taught. Skin structure and thickness will be explained. Preparing before refill will also be covered. Safe cuticle removal for Russian manicure will be shown and taught. Quick salon design will also be covered. Students will be instructed in putting together a price list for work carried out with Efile. E-file Course: You will learn how to use the e-file and do perfect Russian manicure, learn about different drill bits, which ones you need and how to apply gel polish, perfectly near the cuticles. The course will help you to understand how to improve your work and post beautiful pictures. cost: R3,400.00 – MOBICRED AVAILABLE IF PAID IN WEBSHOP! 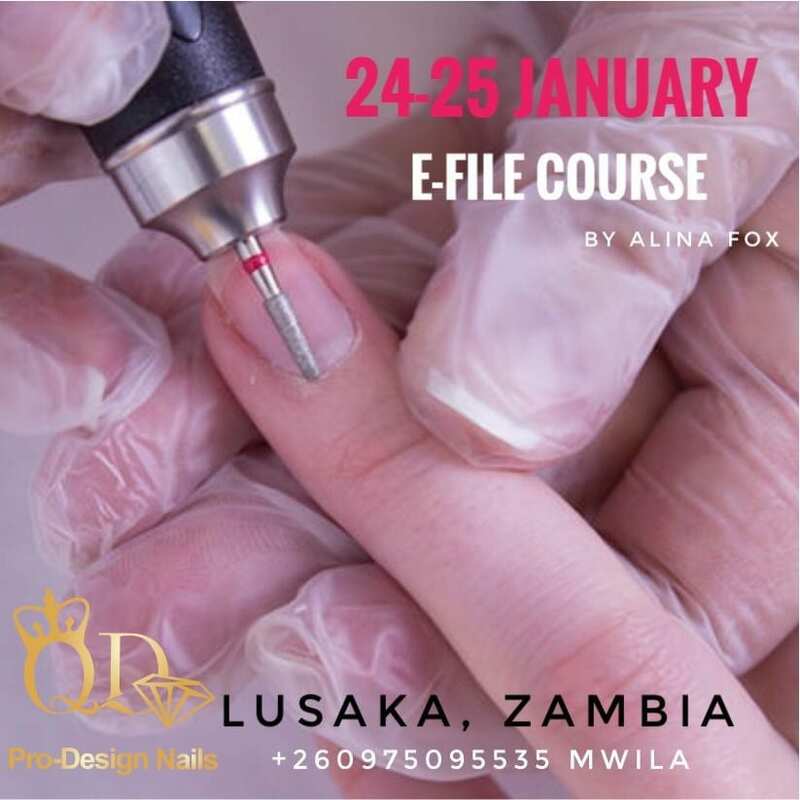 Efile training Lusaka Zambia January 24 & 25 2019, course for experienced techs and beginners! Educator-Alina. This educational efile course training program which is two full days of intensive, hands on training with live models on day two, is a must for anyone who uses or wants to use an efile..
Each student will first of all learn about the efile machine and in addition, how to correctly use the efile, furthermore its capabilities and purposes will be explained. We will cover all types of bits and burs their purposes and uses. In addition how to disinfect and clean properly. Different techniques for using Efile will also be taught. Skin structure and thickness will furthermore be explained. Preparing before refill will also be covered. Safe cuticle removal for Russian manicure will be shown and taught. Quick salon design will also be covered finally students will be instructed in putting together a price list for work carried out with Efile. Day two:- Practical hands on training using a model. Bring your own Efile, bits and burs, this will be another helpful way for you to better understand your own efile. If not you can use ours. A live model will be required on day two, to work on while under supervision of your instructor. cost: R3,400.00 – MOBICRED AVAILABLE IN ADDITION IF PAID IN WEBSHOP! Please join us for this great course, for which we have had so many requests to hold this course again. Spaces therefore are limited. Don’t miss out on what is sure to be a memorable two days. You will not regret it.